The 2018/19 program is open to children born 20011-2006. 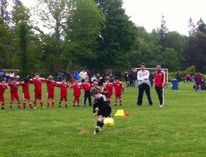 The Development Program at Alba FC is intended to act as a bridge/pathway to our competitive program. The emphasis in this program is on creating technically proficient players that have an understanding of small sided tactics by the time they move forward into the competitive program. The use of various small sided games to teach various aspects of the game are heavily used. Ball mastery, 1v1 attacking & defending, running with the ball, back to pressure and numbers up and numbers down activities are just a few examples of the topics we cover in our curriculum. Players progress at different rates and as such the Alba FC staff ensures to train everybody in a manner that is best for the individual’s needs. AFC embraces a positive environment that nurtures the development of young soccer players both on and off the field. AFC Staff are licensed and experienced coaches whose demonstrations include demanding instruction, step-by-step clarification, and playful joking to bring out the most sensitive technical points for children to grasp and imitate. The Development program is a yearlong program that offers a higher level of training than that of our Recreational program. Focuses primarily on the player and technical proficiency inball mastery, gross motor movements and playing in pairs. Developing talented young soccer players, using fun small sided games and activities to facilitate a dynamic learning environment. 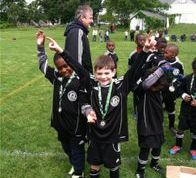 Trains twice per week and plays games over the weekend at Ferry Point Park or Lehman HS. Still uses small sided activities but begins to challenge the players to work in 3’s and 4’s instead of just pairs Trains twice per week and plays games over the weekend at Ferry Point Park or Lehman HS.